Enough sentimental mush. Back to the fun and frivolity! I meant to write about field coats while we were in the midst of crisp weather. Sadly I think we’re on to the sticky, moist fog season. I intend to sell you on them anyway. I have always liked longer coats made of breathable fabric, that embody casual polish. 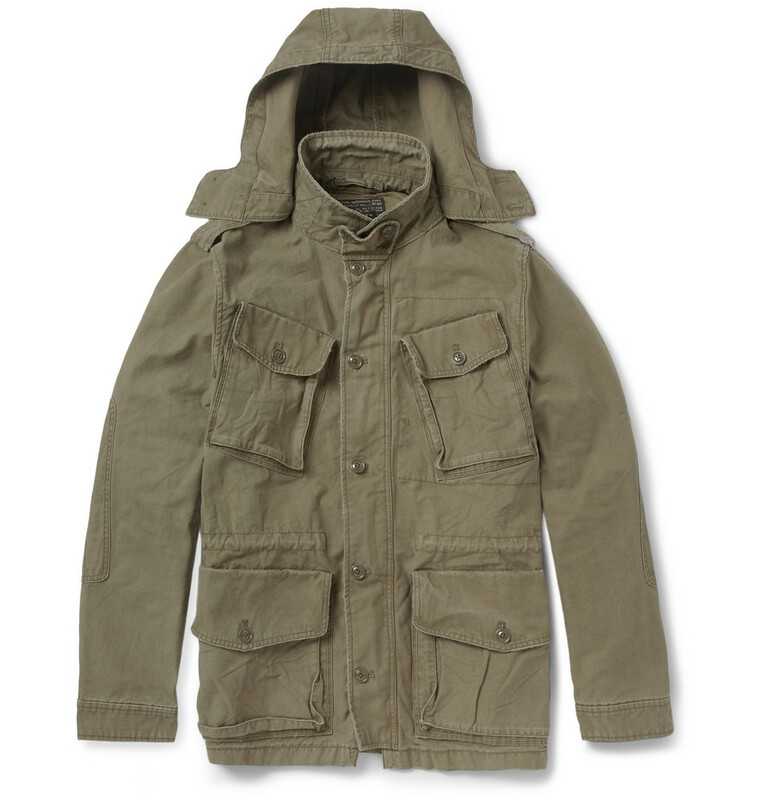 In 2009, on a trip to see Manhattan in the fall, I bought a military-inspired J.Crew field coat, in moss fatigue. It was the right color, right price, and like nothing I already owned. 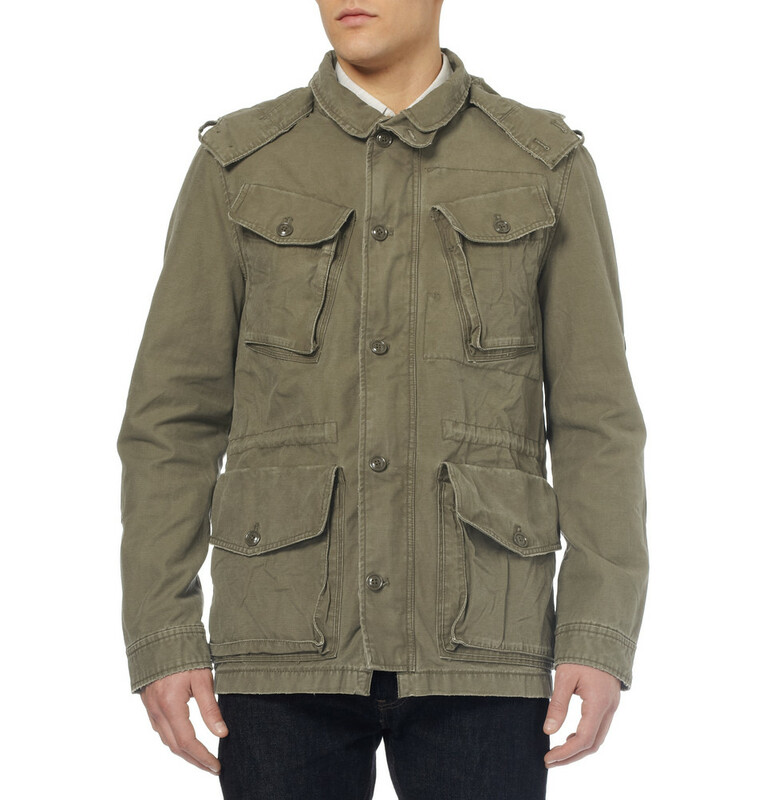 This was about the same time the Barbour hunting-style jackets were becoming popular, but started at $300+. I loved the J.Crew jacket because it fit close to the body, draped well, and had a mid-section drawstring, which gave it an optional shapelier silhouette. Plus a hood, and enough pockets to hide all my goodies. This past fall, MR PORTER began offering the coat on their site, four years later and for $20 more than I paid. To say I felt validated would be…accurate. Now, per convention, a closer analysis of the field coat and its brethren shows a number of apparel terms that are loosely interchanged, but are actually all discreetly different. Field Coat = lined or unlined but not insulated. Four pockets on the front side, a drawstring waist, and a hood. Ends below the waist/belt, above the inseam. In the case of this Uniqlo example, no drawstring, but a cinched waist. J.Lindeberg has a lighter tone example. 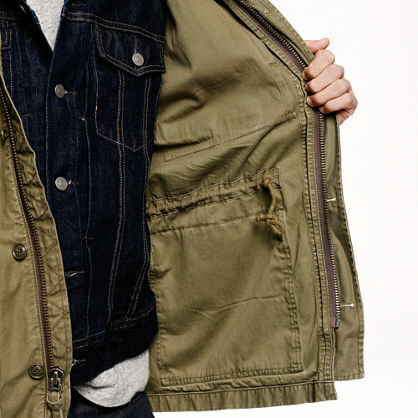 Parka = insulated, with a longer length that covers more. Can have a drawstring hemline, and a boat-tail rear (curved and/or slitted). 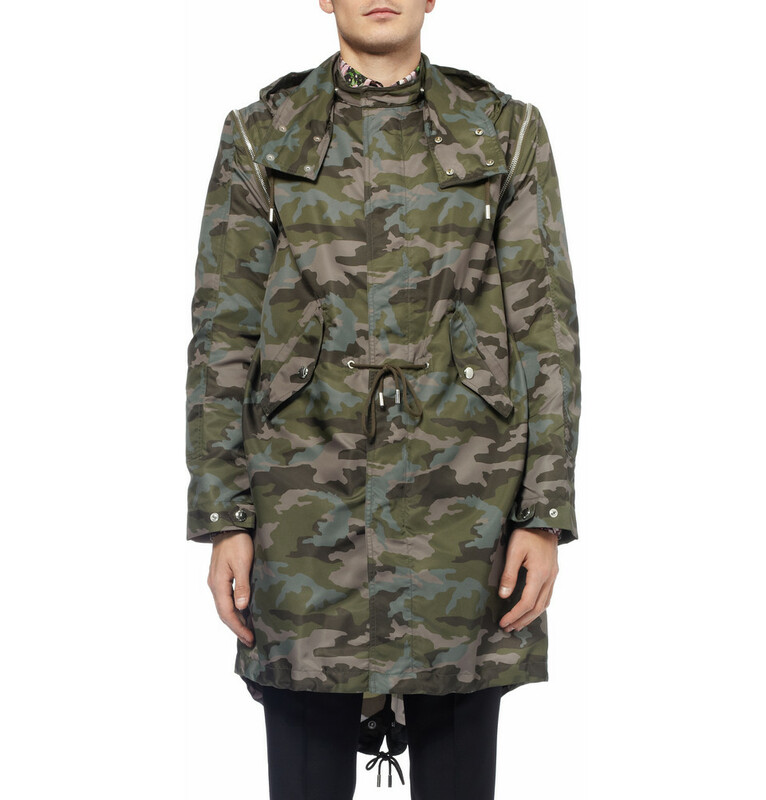 This Givenchy camo parka shows some of those design elements nicely. 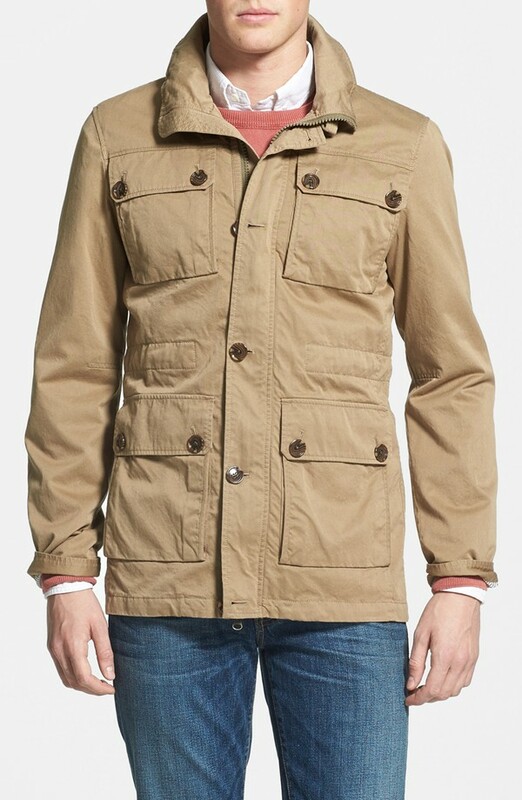 Or, this one from J.Crew. 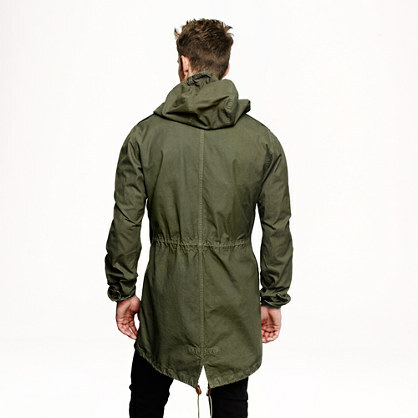 Trench = similar in length to a parka, with an exterior waist belt, a double-breast closure, and no hood. The dressiest of the three. 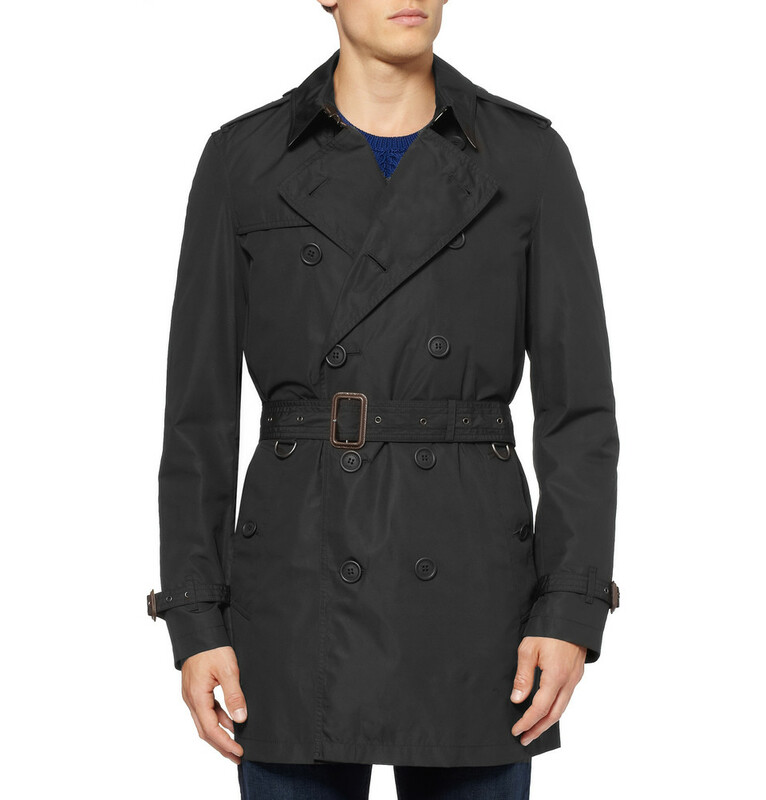 Burberry makes the classic trench, though I find it hard to swallow $900 for a coat made in Vietnam. No comment. J.Crew carries a handful of boutique mens outerwear brands, including Wallace & Barnes, Arc’teryx Veilance, and Penfield, along with their own offerings,with a wide range of prices and styles. It’s where I’d look first. I really love this genre of coats, and have come to appreciate their versatility. Peacoats are too heavy, and can quickly become too toasty underneath. And I hate being too hot. Windbreakers not enough coverage from the elements, and can puff out in the wrong places. Ability to layer is key, almost always, anywhere. I’ve worn my field coat with only a tee, though more frequently with a hoodie. And, who doesn’t appreciate extra pockets? Especially in nasty weather, carrying a bag is a pain. 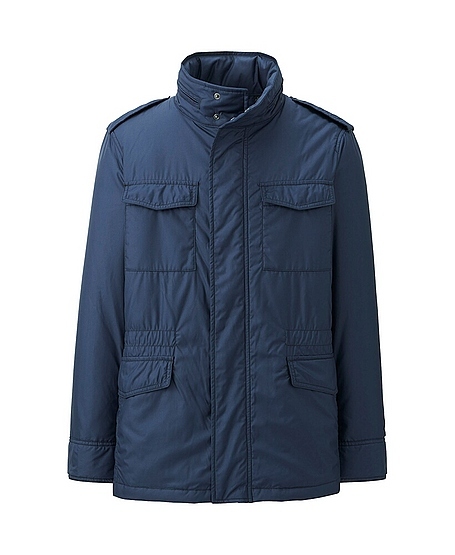 Choices in weather-resistant coats are plentiful, with most ‘field coats’, ‘parkas’, and ‘trenches’ falling somewhere in the middle, on a hybrid spectrum. Truly, it will come down to what level of water- and wind-proofing you want, and what style you’re going for. I prefer a polished, athletic casual look over hard classics (like a trench). Get in touch if you’d like advice on what might work best for you!